Today, work and leisure often happen in one place - at our computer. Resisting the unhealthy level of distractions becomes the everyday challenge. 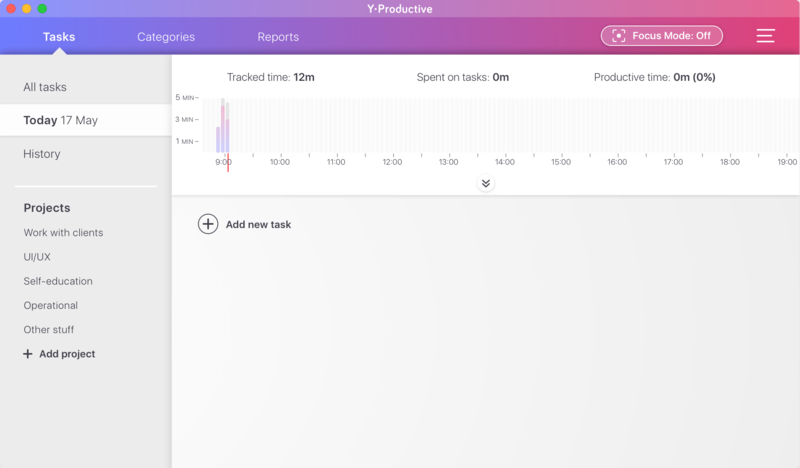 Y-Productive is a personal productivity management application that helps to keep your work under control. 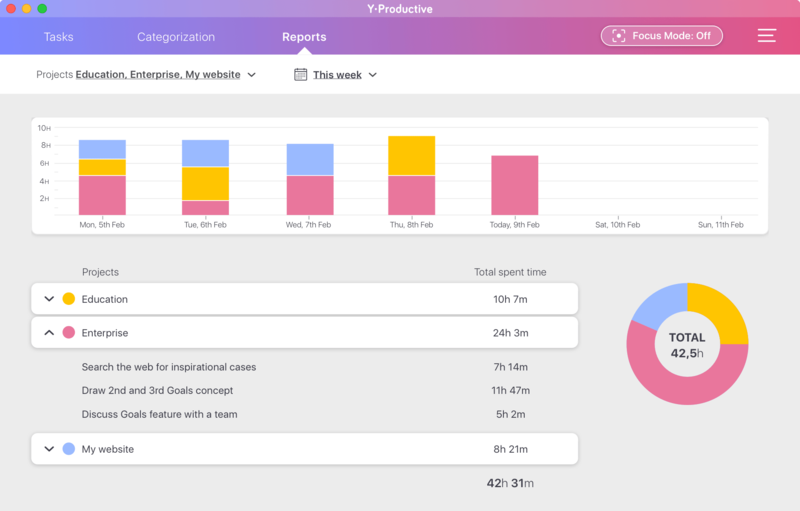 With Y-Productive you always know where goes your work time and what exactly you need to do to improve your work results. 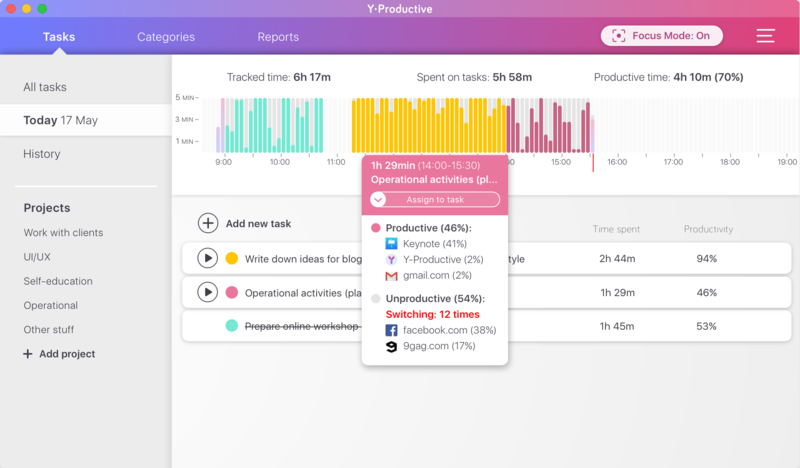 Try Y-Productive right in your browser on our Demo Page. There is also a use case with the detailed interface and day context explanation. 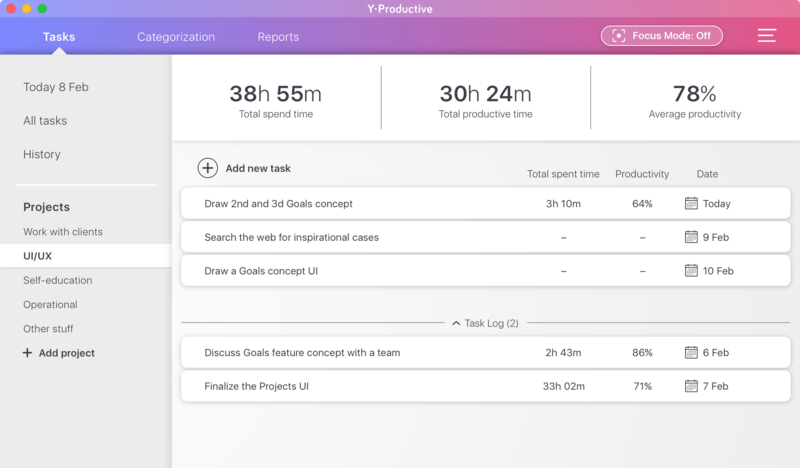 Task management allows Y-Productive users to set the context for any tracked period of time. It helps to easily understand how certain actions affect the performance on a task and what are the weak spots to improve productivity. 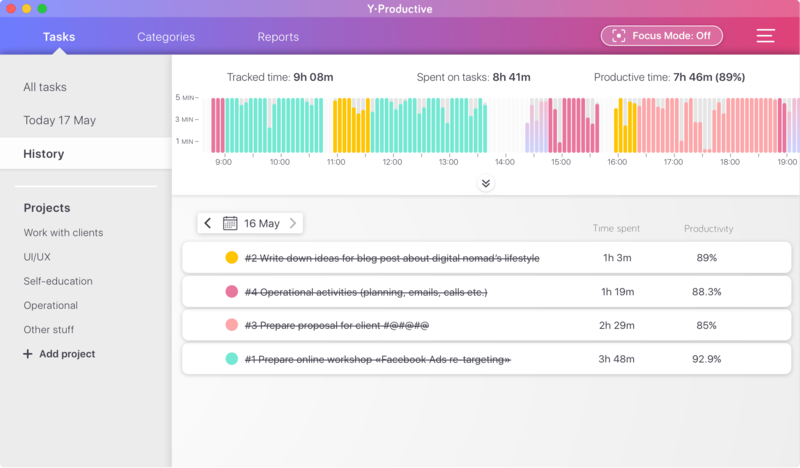 Y-Productive`s chart is not just a timeline. Our users love how insightful and clean it is. b) Number of switches to unproductive websites and apps. All down to 5 minutes of any tracked moment of your working time. While most of the competitors recommend using third-party paid software (Focus, etc. 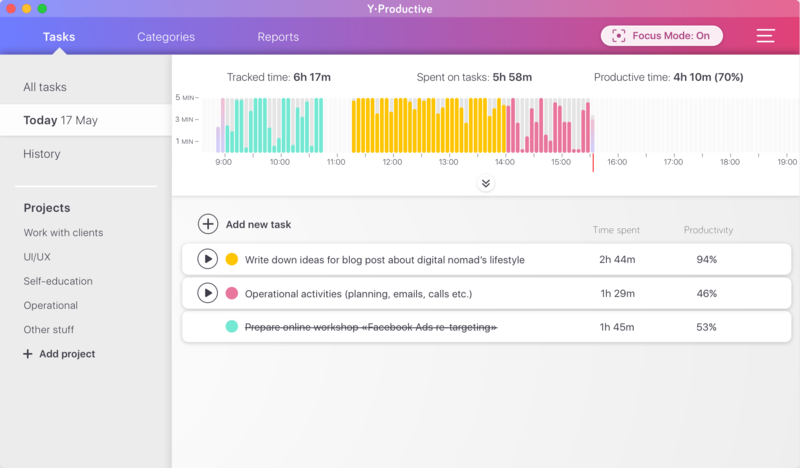 ), we understand that a feature to cut off digital distractions is a ‘must have’ in a genuine productivity app. It improves the ability to concentrate on work right away. It is available as a free extension for Safari, Google Chrome, and Firefox. We have incorporated Intercom chat on our website and in the application. Our users may reach us at any time and share their feedback or ask us a question. A lot of people actually use it. We love speaking to our customers and visitors of our website! 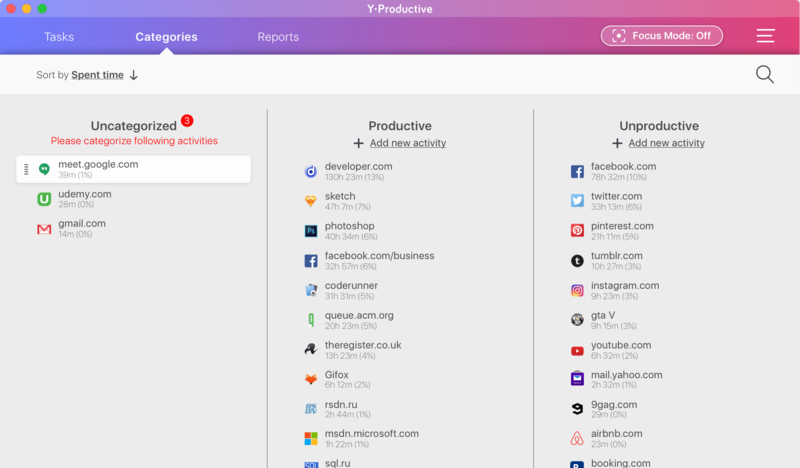 You can take a look at the full list of Y-Productive features and our roadmap here. The creation of the App was inspired by the productivity techniques suggested in “Your Brain at Work” written by Dr. David Rock. c) By analyzing the chart and pop ups the user learns a lot about his work habits. 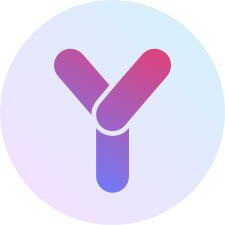 Y-Productive is designed to inspire small noticeable actions to become more productive. 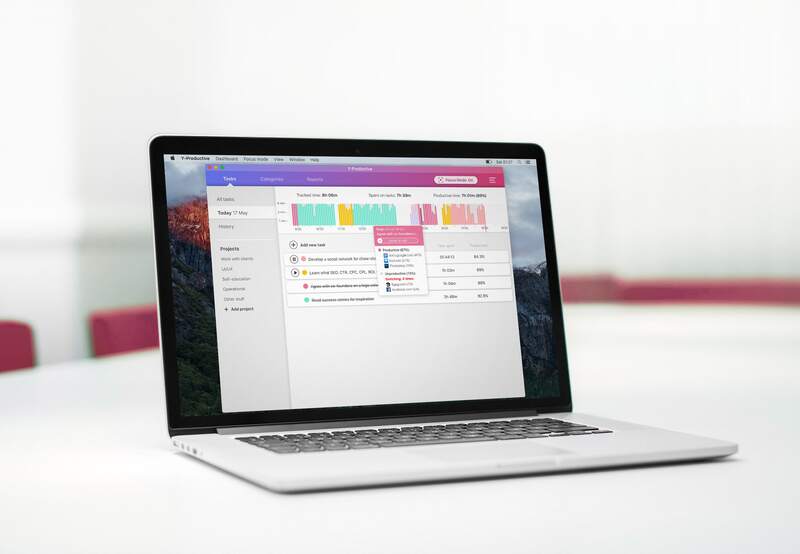 Our users get used to being more organized and focused. "Just being open in the background, Y-Productive already helps to improve my concentration and get myself in a mood to work"
We develop Y-Productive to help people fight the unhealthy level of distractions at work and therefore the quality of their life-work balance. We think that companies like Facebook, YouTube, messengers, similar apps and websites put an unbearable technological pressure on people to win and keep our attention: usually when we don't want it. It ruins the plans at work as well as prevents a healthy rest. 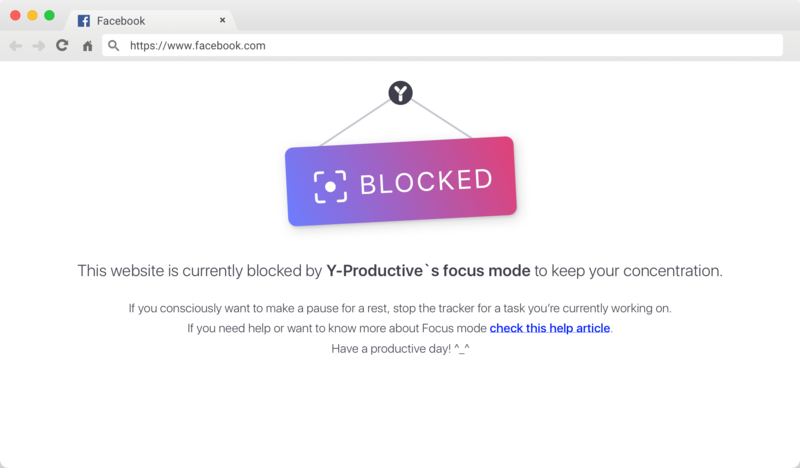 We decided to fight technology with technology and built Y-Productive to reclaim the control over the personal work and distractions. 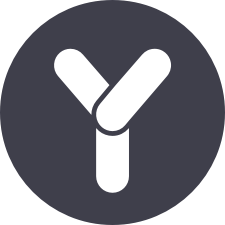 Y-Productive is a bootstrapped company. It took us a fair amount of time to gather as like-minded people and equal co-founders. We now have a great synergy in developing the application. Read the full story of the Y-Productive origins here. For business/startup bloggers we cover our unique non-fixed equity share principle. Read more about our improved version of Dynamic Equity Split here. August 2016 . Vlad and Alex quit their jobs to create a team that values transparency and freedom in the development. The decision is made to set a rule of improved version of Dynamic Equity Split as equity share principle. Alex has several productivity burnouts and is in search of a productivity solution. 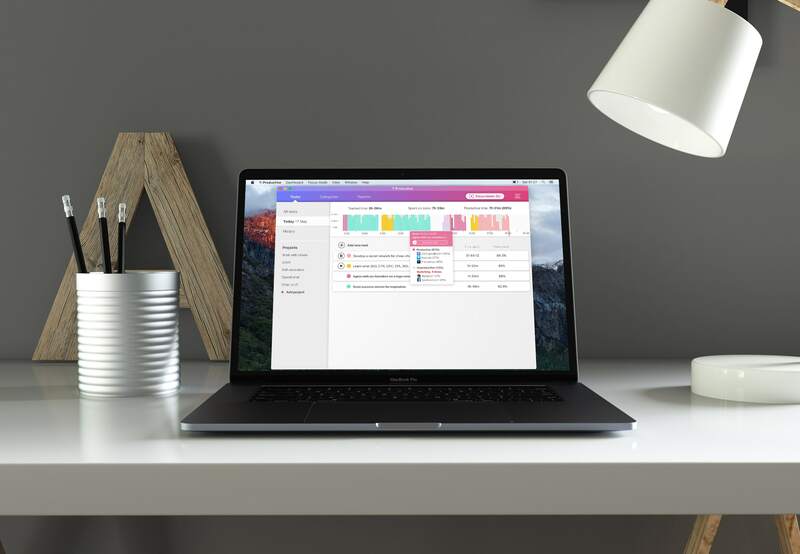 Available time-tracking or productivity software doesn’t help to pinpoint what to do to improve your workday. Alex reads a book “Your Brain at Work”. It provides him with a clue for a scientific approach to cure productivity issues. September 2016. Alex invites his friend Nazar (machine learning specialist) and former startup colleague Anton (developer) to join the team. 19th September 2016. The decision is made to develop a tool that will help digital workers to improve their workday. Alex and Nazar question a lot of freelancers on Lviv Freelance Forum 2016 about their productivity issues. After the forum we agree on a decision to bootstrap the development to be able to listen to our customers as a first step. November 2016 - end of January 2017. The proof-of-concept interviews with digital nomads and UX tests. Vasyl (UI/UX) designer joins the team. February 2017. Artem, a close friend of Alex and senior developer, joins the team. Vlad proof-tests an app idea with a team of his classmates on Student Startup Camp Garage48. 16th of May 2017. 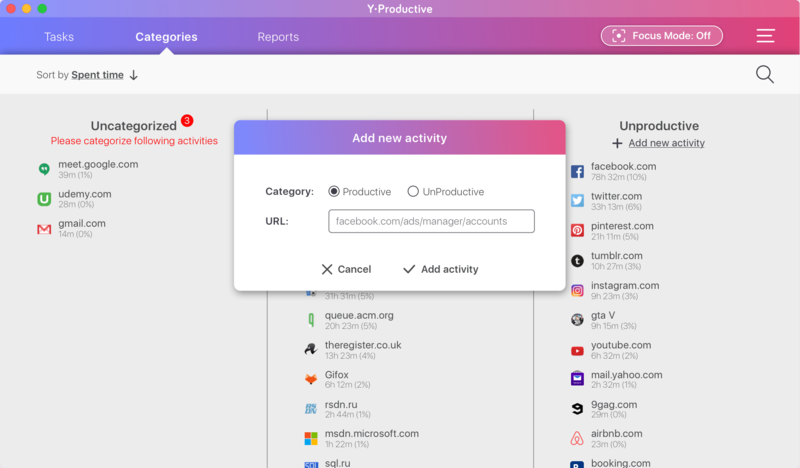 The official release of the Y-Productive application on our own website. Summer 2017. Alex understands that we need to align the brand voice with the users and get rid of the “enterprise” look of our company. Kyrylo, the Head of Marketing joins the team. 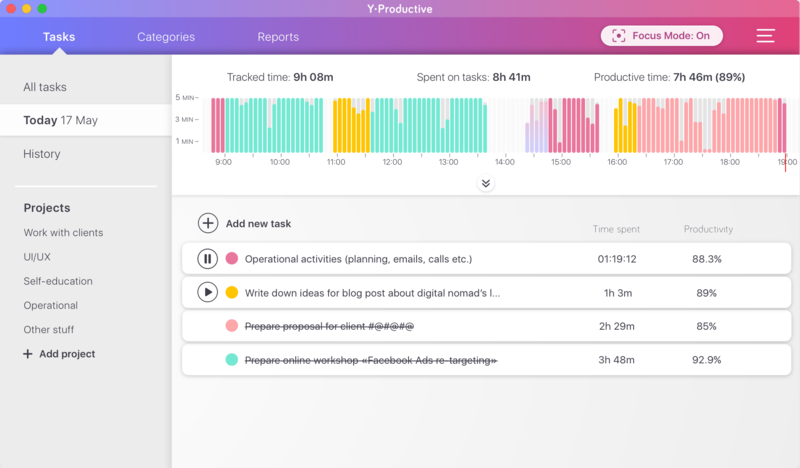 Y-Productive comes with a free 14-day trial and monthly subscription. For more details please refer to our pricing page.